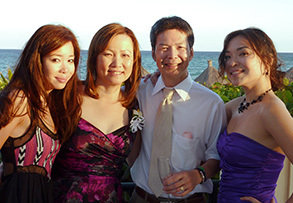 June 2011 will forever be etched in the memory of Amanda Yuen’s mind. It was the day her father was diagnosed Acute Respiratory Distress Syndrome, and was admitted to RCH. He would remain there for five long months. Dr. Steven Reynolds is an intensivist who provides care to critically ill or injured patients at RCH. He was one of the first to assess Les’s condition. “I’ll never forget… he was a bright, articulate, accomplished man, and I remember looking at his chest x-ray and thinking ‘He is really sick, this is going to be really tough on him’, but he managed to survive a very terrible disease,” says Dr. Reynolds. Les required multiple modes of ventilation (breathing machinery) to address his complicated lung issues, and was placed in a medically induced coma for twenty days in RCH’s Intensive Care Unit. “Life for my family revolved around the ICU and we spent every day at the bedside even though there was nothing we could do,” recalls Amanda. A critically ill patient’s care involves a veritable army of highly specialized medical and support professionals, from intensivists, respirologists and nurses, to social workers, physiotherapists, respiratory therapists and everyone in between, working around the clock to ensure the best possible care. In November 2011, Les finally came home. With oxygen support, and the loving care of his family, Les gradually learned how to sit up, walk and eat again, and move forward with some in-home rehabilitative therapy. Although Les feels his recovery has been slow, painful and exhausting, he is grateful to be able to enjoy life with his family, and get outside when the weather is nice. In addition to Amanda volunteering at RCH, the Yuen family will be returning to the ICU before Christmas, as they do every year, to once again say thank you for the care Les received.